I enjoyed seeing St. Vincent at Austin City Limits Festival a few years back so much that I immediately bought a ticket for this show as soon as I heard about it. This was before Masseduction was even announced. Once I finally heard the album, I was a bit skeptical, but still more than curious enough to see what she had to offer. I hadn't heard anything about an opening band, so when the 8pm showtime came and went without any appearances, I wasn't too surprised. Besides, the house music was Brian Eno and David Byrne jams that were a pleasure to hear on such a large sound system. But fifteen minutes later, when a projection screen was revealed, it all became a bit clearer: we were getting treated to a showing of The Birthday Party, a short film directed by Annie Clark, the sole member of St. Vincent. The film depicts a woman trying to hide the death of her husband from their child on the morning of the lattermost's birthday. It relied on suspense and black humor, but the suspense was overplayed by the extremely heavyhanded audio cues. The final scene was accompanied by intense music from St. Vincent, which matched the emotional content of the action, but I found the whole setup rather predictable. The film was artfully produced and not without its clever touches, but the plot wasn't notable and the style was just a bit gimmicky. 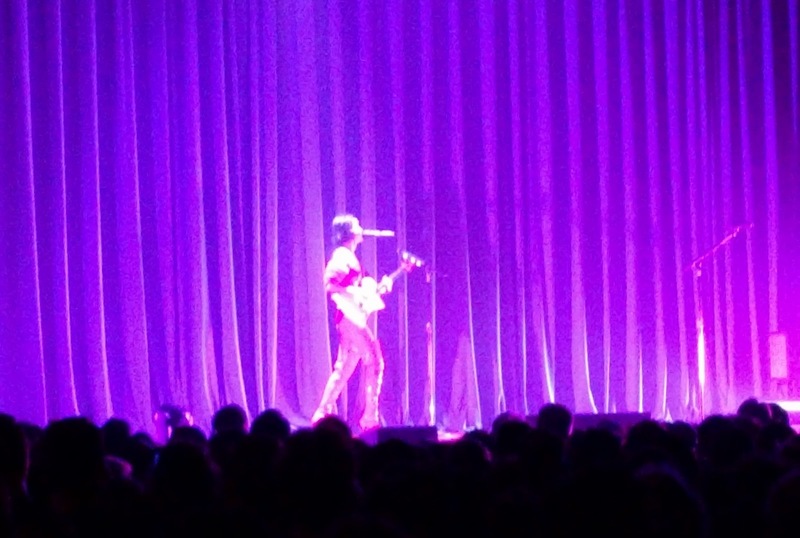 When St. Vincent appeared on stage in person, she was alone with just a microphone. The curtains still hung around most of the stage, implying that there was still something to hide. After performing a song from her debut album to a backing track, a masked stage hand brought her a guitar. She continued to play songs from her career in chronological order, mostly in pre-recorded arrangements that seemed toned down and scaled back. The curtain revealed the rest of the stage at some point, but there were no additional musicians or instruments, just a couple microphones. The backing tracks initially focused on arty, less rock-oriented arrangements, culminating in "Strange Mercy", which featured nothing but strings and Clark's voice. The songs from St. Vincent (2014) were more fully synthesized with the expected dance beats. And then she left the stage. The stage lights came on for just a few minutes before the curtain came up again. St. Vincent appeared again with her guitar and a change of costume. She proceeded to play the entirety of her new album, Masseduction, in full. Again, she used backing tracks for everything she couldn't do herself. She left again and that was it. It was a strange concert. St. Vincent's persona is always somewhat affected, sarcastic, bizarre, and mechanical, so part of the show felt like she was making a big joke and everyone was in on it. Her choreography and movement felt like something from the Talking Heads Stop Making Sense playbook, except that she was the only live performer. The decision to rework and play around with the arrangements of her older songs was solid, but without a live band to give them any life, they felt stiff and artificial. 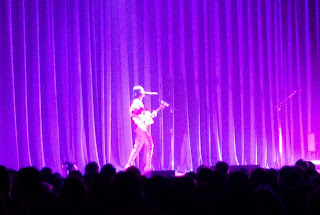 St. Vincent's guitar style was wild and fascinating, but she wasn't even manipulating the pedals and effects herself. The chronological ordering of the material was another interesting choice. but it meant that the show built up to a crescendo in the first half, then slowly came down as the performance of Masseduction reached its end. I'm usually skeptical of full-album performances and this was no exception. Coupled with the reliance on backing tracks, the set was entirely predictable. Worst of all, there was no encore. A few strong back catalog tracks could have brought the show to end on a high note, but we were left with nothing further. 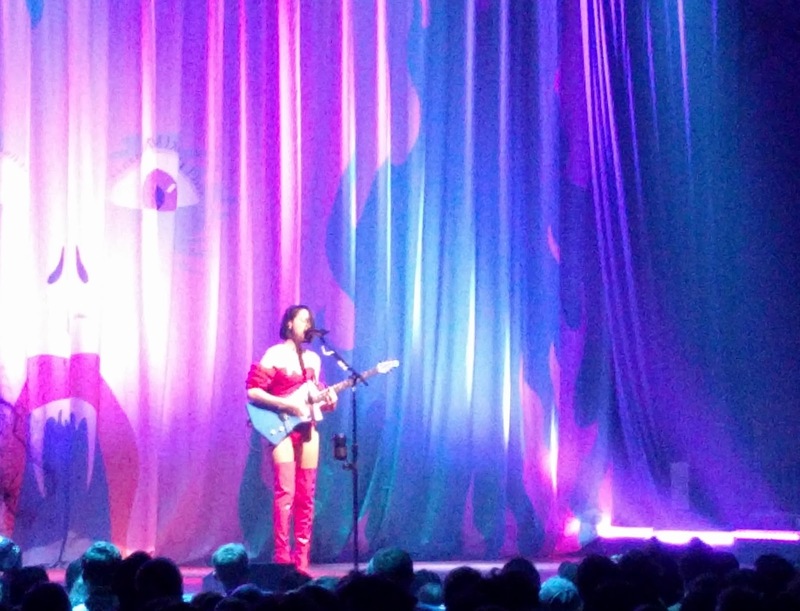 St. Vincent's vocals and guitarwork were as strong as ever, and her stage presence was commanding. I appreciate her style and her willingness to experiment with different ideas, but I don't think many of her choices succeeded at this show. Most of the best elements that drew me in when I saw her perform with a band at ACL were absent. Playing to a backing track sapped away most of the energy and excitement. The songs were good, but there was hardly any spirit in it. If St. Vincent goes the way of an electronic pop star, then so be it. At least she can still play a mean guitar.